Roy Baumeister's 2012 book Willpower: Rediscovering the Greatest Human Strength argued two things that are intuitively appealing. The first is the primacy of willpower. This idea is that willpower is a very important strength which enables us to exercise self-control which is essential for achieving our goals. The second is about ego-depletion. This idea is that willpower is a limited resource. In other words, when we have used our willpower to concentrate and resist temptations this will leave us with less willpower to take on new challenges and resist new temptations. Both ideas are in trouble. The existence of ego-depletion has recently been seriously challenged. First, a meta-analysis of previous studies give reasons to doubt the existence of ego-depletion. Second, a large-scale replication study project did not confirm the existence of ego-depletion. Other studies also cast doubt about the other Baumeister idea, the primacy of willpower. Specifically, Magen et al. (2014) that looking differently at temptations (reframing) makes it possible to exercise self-control without expending additional willpower. New study: "willpower does not translate to long-term goal success"
Milyavskaya & Inzlicht (in press) followed 159 students for a week using experience sampling and daily diaries. What they found is that students who reported exercising more deliberate self-control did not achieve more goal-progress and students who reported fewer temptations achieved more goal-progress. 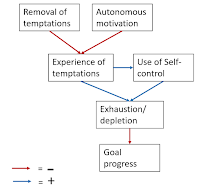 Students who experienced more temptations, were more exhausted (depleted) regardless of whether they had resisted those temptations, and achieved less progress (read more). 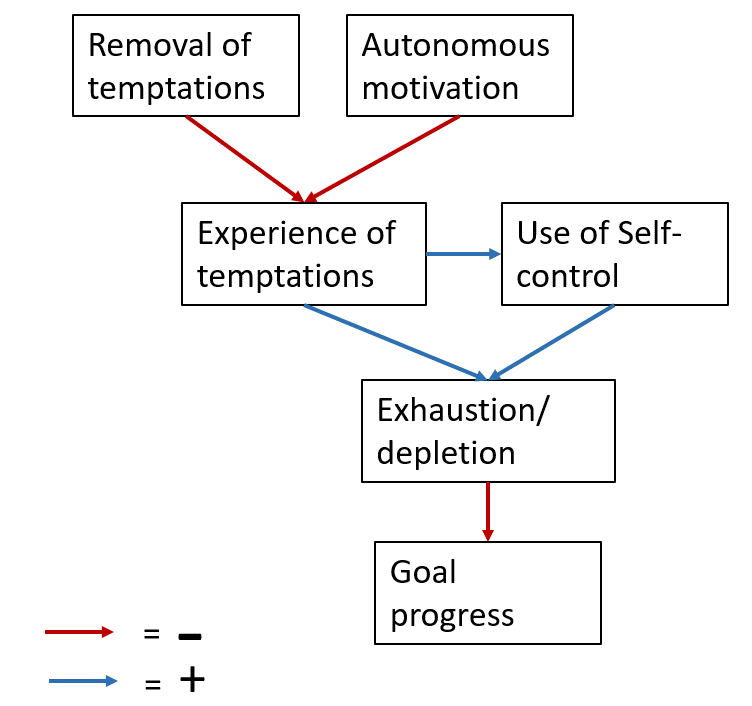 The authors conclude that the path to better self-regulation lies not in increasing self-control, but in removing the temptations available in our environments. I agree with that but I'd like to add another implication. Previous research has shown that ego-depletion does not happen when we are autonomously motivated (which means doing things we find interesting and/or important). I think that doing things which are so motivating absorbs our attention in such ways that we notice temptations to a lesser degree due to which we need less willpower.